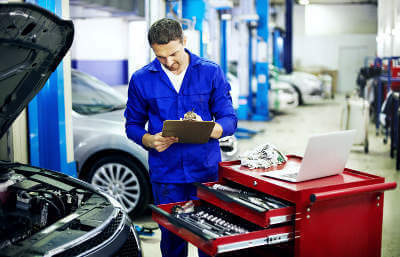 t’s that once-a-year dilemma for anyone who runs a vehicle which is three or more years old - you need to get it through an MoT test, but particularly, want to do what you can to ensure that you can then enjoy another year of trouble-free motoring. So you prepare yourself for having to part with the test fee; a maximum of £54.85 for a car test, and £29.65 for a motorbike, so not exactly loose change; and throw yourself on the mercy of your local MoT testing station - which could be your regular franchised main dealer, a ‘fast fit’ centre, or a local, independent garage - and hope for the best. But how do you know whether the one you’ve chosen will be honest with you, and do just the work you need and return your car to you in a good condition at least as good as it was when it was left with them, without ripping you off? This led to a climate of general mistrust between many people and garages, which reached such a stage, due in part to many stories making their way onto television shows such as Watchdog, that the whole sector seems to have been tarred with the same brush of being untrustworthy and generally out to make money at the expense of unsuspecting and not especially knowledgeable customers. Given the highly technical nature of the cars, trucks and other vehicles we drive, this obvious ‘knowledge gap’ will always remain - but in an effort to encourage more transparency between anyone who makes a living selling or repairing cars and their customers, the sector has funded the establishment of Motor Codes. In the past, sharp practitioners could always be weeded out through word of mouth, although this would have still taken time - and if they were savvy enough, they could have got away with it for years. But as in so many other areas of our lives, we have the internet - and specifically social media, along with a variety of online public forums - to thank for providing the impetus for the industry to address the issue of its general perception. Given that government was reluctant to step in and impose standards - and in any case, whatever mechanism it might choose would prove hugely costly to both set up and police - the factor which is really transforming the way people find and deal with garages for their car repairs and MoTs is the all-pervading spread of social media. Go to any site, whether it’s Facebook or any other consumer forum, and car-related topics are one of the biggest sources of conversation. This is why Motor Codes, a wholly-owned subsidiary of trade body the Society of Motor Manufacturers and Traders, was established. The last point is important in allowing Motor Codes to enforce its principles, while it also has the backing of the Chartered Trading Standards Institute, the professional body of people employed by local councils with the power to take action against businesses for any violation of consumer law. Motor Codes is also backed by the AA, which carries out the independent checks on each scheme member. These entail an initial inspection within three months of a business signing up to the programme, then a regular check on each one, on a two-yearly cycle. The AA was keen to be seen to be involved in proactively seeking ways of cutting down on shoddy repair work which the government watchdog, consumer watchdog the Office of Fair Trading (OFT) - since absorbed into the Competition and Markets Authority - estimated was costing drivers £4billion a year. The OFT then threatened the industry, calling on it to put its own house in order, or face the prospect of tougher rules and enforcement to drive up standards - and Motor Codes, with its attendant code of practice, is its response. As well as the standards of work, the code also has power to investigate complaints relating to how a garage advertises itself, its procedures for booking-in work and carrying out repairs, the conduct of its staff towards customers, invoicing, and how it investigates and sets out to solve complaints. Garages have to pay an annual subscription fee, and in return can prominently display a range of Motor Codes information. The scheme runs its own feedback programme, and at the time of writing was even offering an incentive for customers of any of its members to submit their views, in the form of £500 in shopping vouchers. As a result, Motorcodes says it hopes to “build a robust picture of about the real-life situation in the garage sector” - but whether it achieves this will depend on the size of the response it gets to its poll. If it all goes wrong and you can't resolve any dispute with the garage direct then a free consumer advice line is available, on 0800 692 0825. This can intervene on your behalf if you have a complaint about a Motorcodes member and even carry out independent arbitration between parties if there is no agreement - but this will involve costs of about £500, which has to be split between both parties. When it comes down to it, you may already have a garage which you trust, and will return to every time, no matter what, for all your servicing and MoT needs. But not everyone is as lucky, and as people become increasingly aware that they can shop around to find a garage which is either local to them, is generally well liked by its customers, or does good work for the most reasonable price, there is a growing need for services such as those provided by MyCarNeedsA.com, to help people navigate their way through the often bewildering maze of options available. What’s your favoured way of finding a garage for routine or non-routine work on your car? And have you changed the way you look? Let us know via Twitter or Facebook.